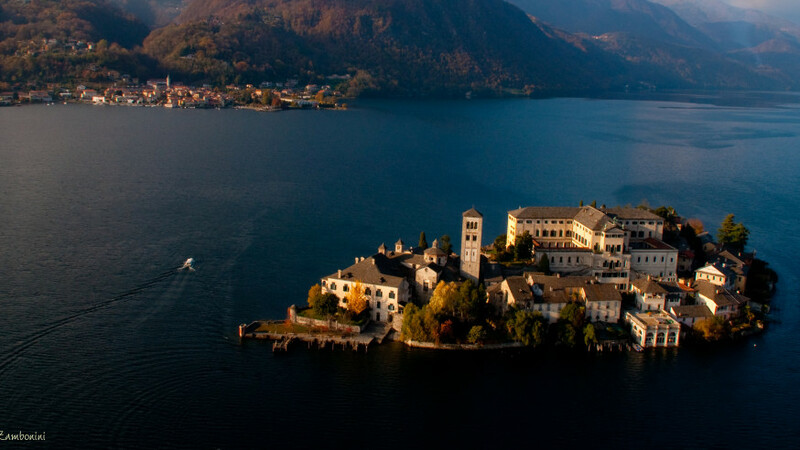 Lake Orta, known as one of the most romantic lakes in Italy, is situated in the Cusio area, which extends from the lower area of the Ossola valley to the western shore of the lower Lake Maggiore area. Its main centres are Omegna and Orta San Giulio. Omegna lies at the northern end of the lake; it is famous for its production of quality kitchenware, and for the festival of its local patron saint, San Vito. From Omegna the road round the lake leads along the western shore to Nonio, then Cesara, where the Sanctuary of the Madonna del Sasso (Virgin of the Rock) rises in a panoramic position. Continuing into the province of Novara, the road goes through Pella, a small holiday resort, San Maurizio d’Opaglio, with its Tap Museum, and Gozzano. The itinerary returns northwards to the ancient village of Orta San Giulio, which with its island is incontestably the prettiest place on the lake. A medieval burgh rich in history and art, Orta is a gem delighting visitors with its tall aristocratic houses and narrow cobbled streets. You can take a boat from the little harbour to the picturesque Island of San Giulio, dominated by its Romanesque church and an ancient monastery. On Lake Orta, we organise tours, team building activities as well as gala dinners.